Connects smartphone, tablet or external hard drive with Micro-USB 3.0 port to any computer. This USB 3.0 SuperSpeed cable works with Samsung Galaxy S5, S6, Note 3, Note Pro 12.2, Portable SSD T1, and SanDisk Extreme 500 Portable SSD. It is USB 3.0/3.1 GEN1 compliant, has braid shielding and supports speed up to 5Gbps. 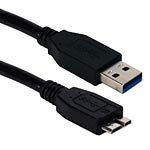 This cable is for USB 3.0 devices only.